For three summers in a row, I’ve planted tomatoes. Pots and dirt were purchased, weeks of ritual watering followed, and then I waited. And for three summers in a row, I’ve picked a single, though beautiful, tomato. The pots didn’t work in the shady yard; bigger pots didn’t work either in another house’s sunny yard; and the holes in the ground just look like Rachel’s fault now. Cages and twine tying the vines to the fence didn’t help. Nutrient dense compost did squat. Vacationing–and not watering–during the hottest weeks in July and August certainly wasn’t ideal. Squirrels and birds also feasted on the green fruits. Nothing worked. Apparently, I just didn’t inherit my father’s and grandfather’s green thumbs. Even basil and lettuce struggle under my not-so-watchful eye. Aside from the requisite pastry baking, a visit to my parents’ house also means I’ll get to go home with bags full of their successfully grown produce, like tomatoes, zucchini and plenty of herbs–just not the butternut squash, my mom said. This late in the summer–well, it’s fall now–their tomato plants are still going, meaning a bowl of tiny yellow tomatoes and Romas still sits on the kitchen counter. Well, obviously I helped myself to a few, along with a new jar of homemade peach jam and the leftover Danish to take to work (check back for more on that!). 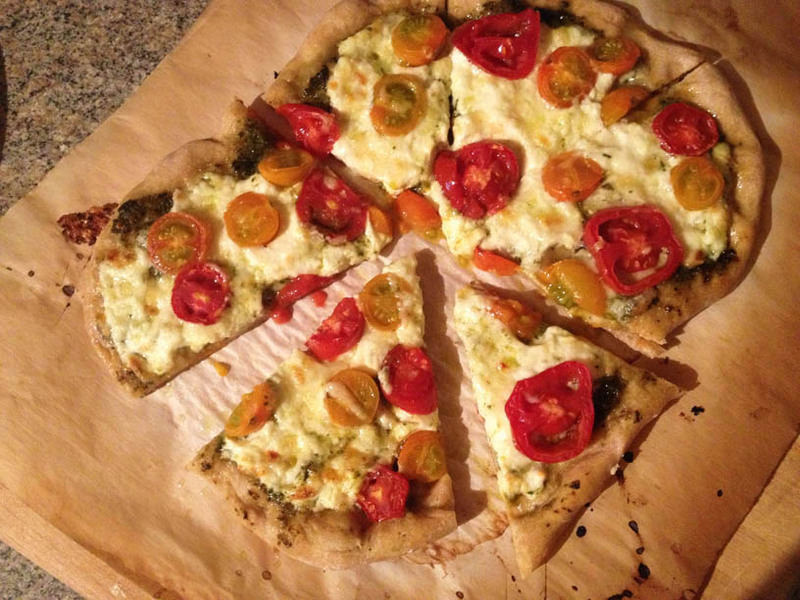 Those tomatoes made their way on top of a personal-sized pizza tonight. Leftover ricotta mixed with swiss (no mozzarella in the fridge!) 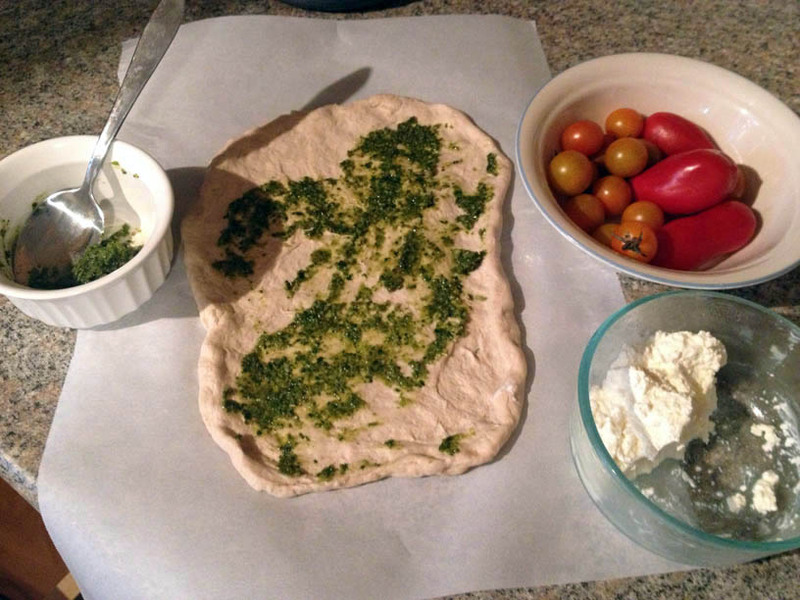 and Parmesan, frozen garlic scape-basil pesto from early this summer and frozen whole-wheat dough made for a simple and quick dinnertime prep. Last week, with yet another eggplant needing to be used, I tried the eggplant calzone from The Smitten Kitchen Cookbook–I’d already discovered I like the vegetable when mixed with homemade ricotta, so add some bread and sauce, and what could go wrong? But since I made a smaller version with just half the dough, the other half got stashed in the freezer for the weekend. Time seemed to help the dough get better, as it was easier to work with and puffed up more in the oven. I’d recommend letting the dough–the cookbook’s “leisurely” version–sit for longer than the suggested 8 hours so the yeast has more time to do its thing, and the flavors develop more. Other recipes may be better, but this one wasn’t horrible, and was just the right size for one person. Here’s another good choice. Pour the warm water into the bowl of your electric mixer, sprinkle the yeast over the water, and let it stand for 5 minutes. Add the flour, then salt, andmix with your dough hook at a moderate speed until the mixture starts to form a craggy mass. Reduce the speed to low and mix for 5 minutes, letting the hook knead the mass into a smooth, elastic dough. Remove dough and wipe out the bowl. Coat inside of bowl with olive oil, place dough back in, and cover with plastic wrap. Place in refrigerator for 8 hours or overnight. (Note: Let it sit even longer if time allows.) When you’re ready to use it, remove from the fridge, let it come back to room temperature, and finish doubling in a warm spot. Once the dough has finished doubling, turn it out onto a floured counter, pizza peel or baking sheet, and let your recipe take it from here. Bring the milk, cream and salt to a full boil, stirring occasionally to prevent burning. Remove from the heat, pour in the vinegar and stir once. Let the mixture sit at room temperature for at least 1 minute and up to 10. It’ll curdle, and the curds and whey will separate. Ladle the mixture into a sieve lined with dampened cheesecloth set over a large bowl. Let drain at room temperature for 30 minutes–longer for thicker, shorter for moister ricotta. Use now or refrigerate. Preheat oven and pizza stone to 500 degrees. Pull your round of dough into a circle, shaping it gently so that you still have a thicker crust around the edge, and set on a piece of parchment. Spoon on pesto. I used a garlic scape-basil pesto that I’d frozen in an ice cube tray earlier this summer, but any variety or store-bought would also work. Mix ricotta with grated mozzarella (or swiss, or whatever soft cheese you have) and a little Parmesan. Just use your best judgment on how much cheese you want. Spread over the pesto, and top with tomato slices. 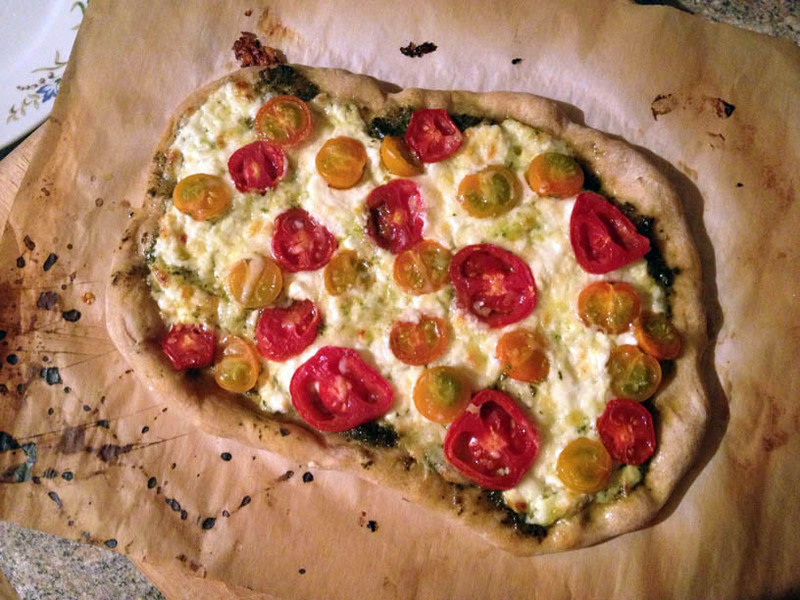 Place the pizza-on-parchment on the hot pizza stone, and bake for 6-10 minutes, until the crust starts to brown on the bottom and the cheese just starts to turn golden in spots. Enjoy!